Thank you for sharing DonorSnap! Reports -- Are you getting the most out of DonorSnap? We know that you share your experience using DonorSnap with other organizations. Those referrals have helped make DonorSnap what it is today. For the next two months, we would like to give back to you for doing what you are already doing. For any new referrals you make and report using this form by May 31, 2015 that sign up and use DonorSnap for 31 days, we will reward you with $200. As long as the organization has never contacted DonorSnap and they sign up by July 31, 2015, you are eligible for the referral reward. Get started today and let us know who you are referring to receive your reward. This month we are continuing the theme of pointing out features that you may not know about or may not have used yet. 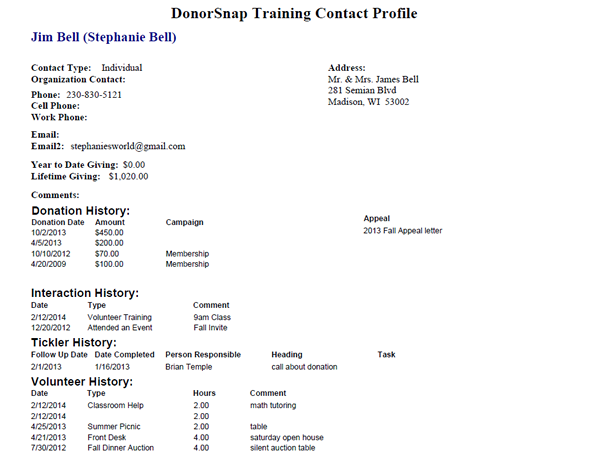 A few months ago DonorSnap released a few new reports to help compare your fundraising between specified time periods, project pledge income, and print contact profile reports. Keep reading to take a look at each of these as well as a few of our other favorite reports. This report gives you a basic overview of one contact. It's perfect for creating call sheets or reference cards with a snapshot of information to help facilitate an informed conversation. This report can be customized to hide sensitive data like donation history or include all of the contact's records. If you don't see the Contact Profile option under the Reports menu, you need to enable it for your user account. This video will show you how to enable features for a user account. When you are looking to compare giving data between multiple time periods, this report is your best bet. It will group each of your donations in columns according to the time period that you select (monthly, quarterly, yearly, or custom) and segment it in rows according to contact, donation type, campaign, etc. The possibilities are virtually limitless, so watch the Periodic Comparison help video to learn more. The pledge forecasting report does exactly what it says -- it shows you the anticipated income from pledged donations. The settings of this report can be customized to display pledges by contact, campaign, contact type, and several other fields. 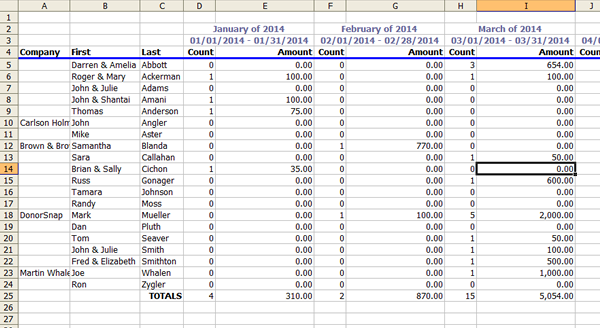 Group your time periods by month, quarter, year, or a specific number of days. Watch the Pledge Forecasting video for more information.